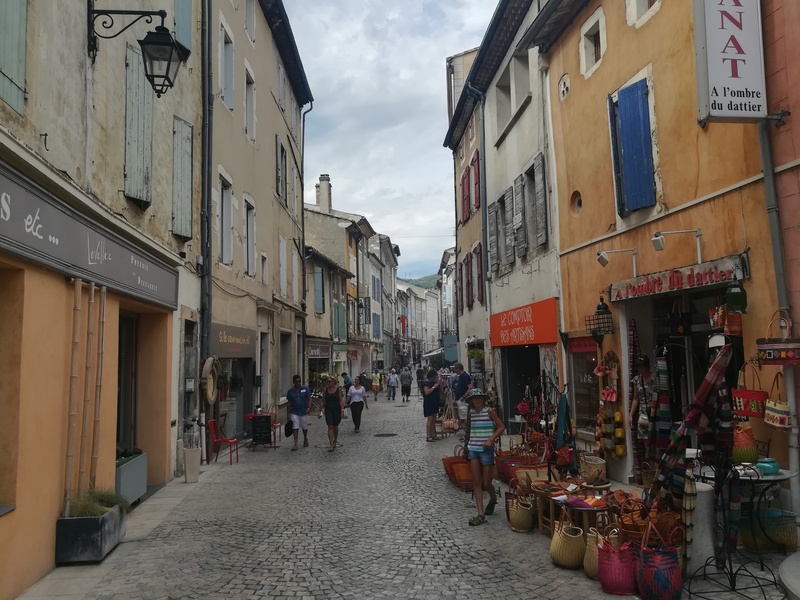 Leaving the buzzing river town of Saint Martin d’Ardeche, I had a long day to Viviers on the banks of the Rhone River. Like the previous few days, the terrain was less than spectacular. 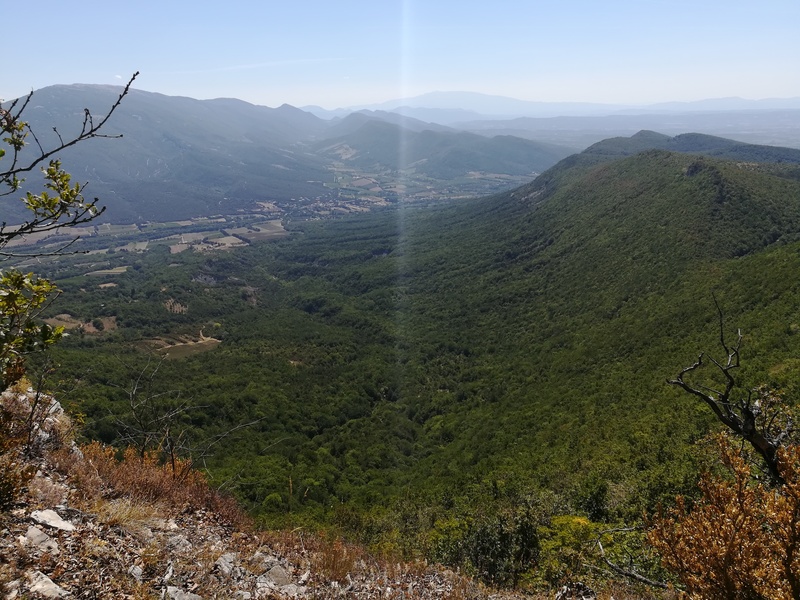 The first 27km to the village of Saint Montan was again on boring dirt roads through the dry and shrubby hills with almost no views. 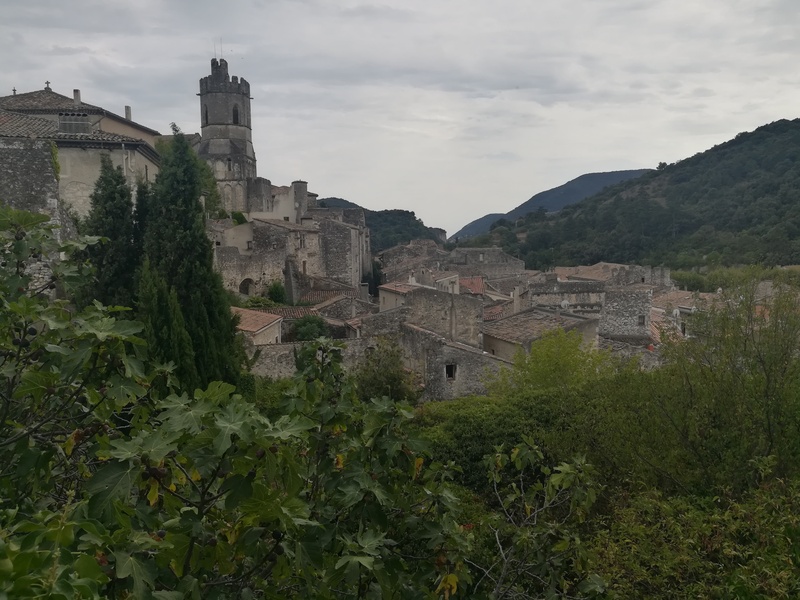 I was thankful to arrive in Saint Montan, which is a very impressive little medieval village. However, as soon as I entered the village it started raining. I took cover for a bit before skipping through town to find a cafe shelter to wait it out. After a bit the rain stopped, and I used that brief break to explore the old village and castle. I didn’t take too long though, as I still had another 12km to Viviers where an Airbnb was waiting. Soon after leaving Saint Montan the rain started again, and I had to break out the poncho until I neared Viviers. Viviers was a strange village. It was beautiful, but noticeably less maintained than other villages, and it was really dead. There were very few shops or restaurants, and few people for the size of the village. The castle was quite impressive though. The next day marked a nice milestone for me, with the crossing of the Rhone River. When you have a chance to cross a major river on a walk, it’s always an important spot. After the crossing and taking a millisecond to pat myself on the back, I followed the rolling hills though some short forest and dry grass trails before emerging at the lush, green Abbaye Notre-Dame d’Aiguebelle. While not a huge or intricate monestary, it was beautifully simple and tranquil even though there were a fair number of people visiting. 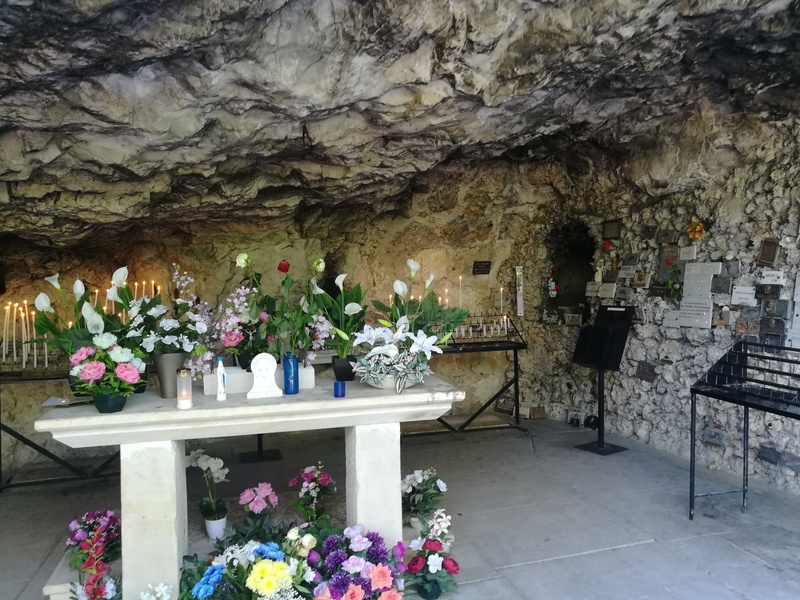 I particularly enjoyed the grotto. There were some excellent forests and nice rolling hills leading to my final destination of the day, the tiny hillside hamlet of Le Fraysse. 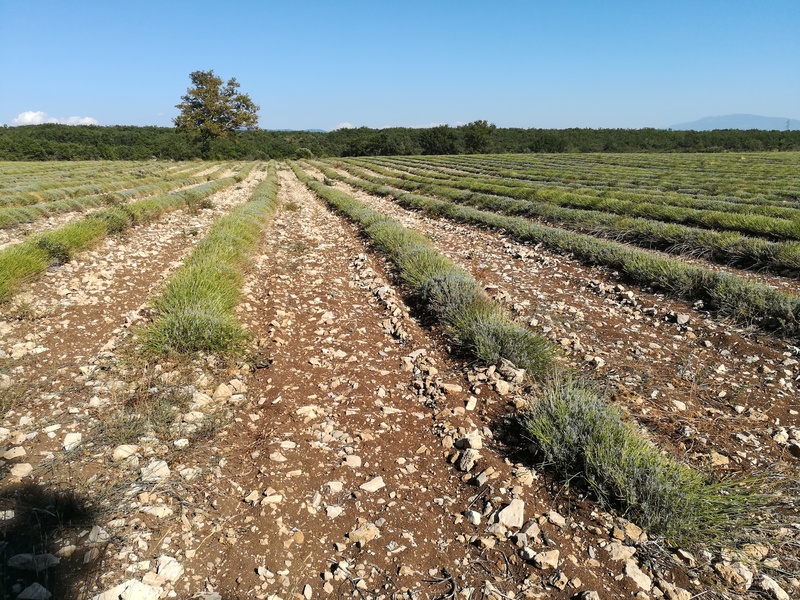 This part of France is dotted with lavender farms, which are a riot of purple when in full bloom. However, it was just recently lavender harvesting season, so no purple. But, the evenly spaced rows of lavender bushes are still interesting. 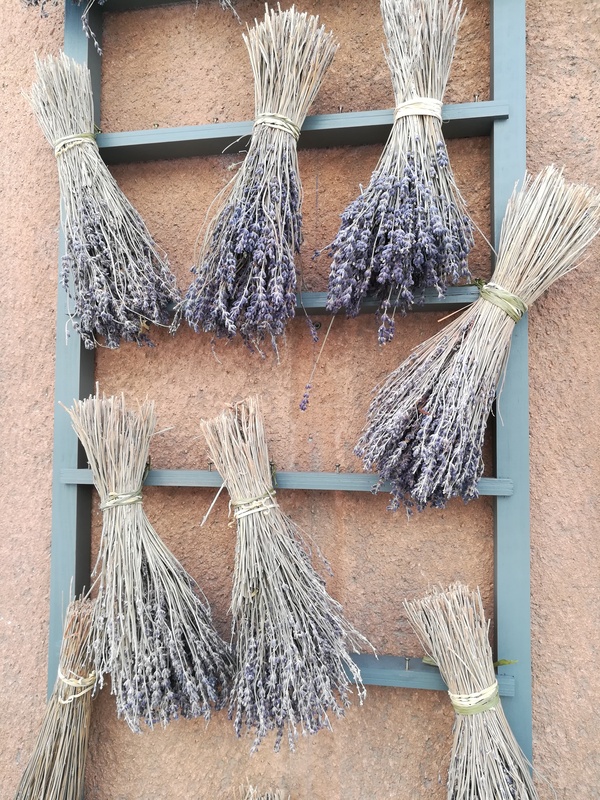 Many of the villages sell lavender products and bunches of dried lavender to hang in your home. I camped in a roadside trailhead about a kilometer past Le Fraysse. Le Fraysse did not have potable water available from the fountain, and a local confirmed that it was indeed non-potable, so I ended up having only about 2.5 liters of water for camping and the next day’s walk. The next day was rather warm and there were many exposed parts, so conserving the water I had was difficult. I ended up getting a bit dehydrated during the day, which triggered a migraine after I arrived in my rest stop of Dieulefit. This is only the first or second migraine I have had since starting my trip, and I needed to take medication for it once I started feeling nauseated and having motion sickness symptoms. But, that was the negative part of the day. The good part was that the path and scenery finally improved after several days of, frankly, boring and lackluster terrain. While the climbing took some work, the views were a just reward for the dehydration. Dieulefit was an excellent stop for a rest day. 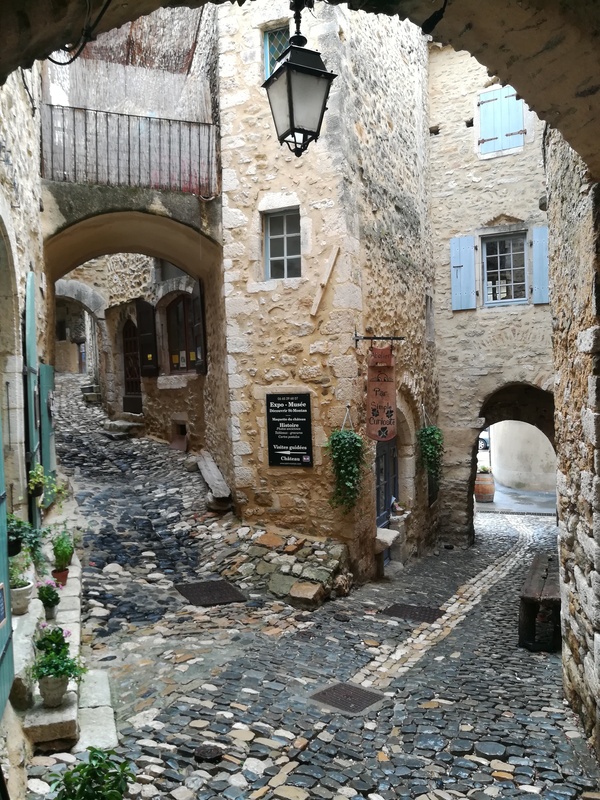 A pretty village with a history of pottery and ceramics. Spent a nice afternoon strolling around, browsing the shops, and people watching over lunch and coffee. I now have a 6-day stretch through the mountains and ski areas of the Rhone-Alps before taking a premature rest day in Grenoble, the only major city I visit in France.